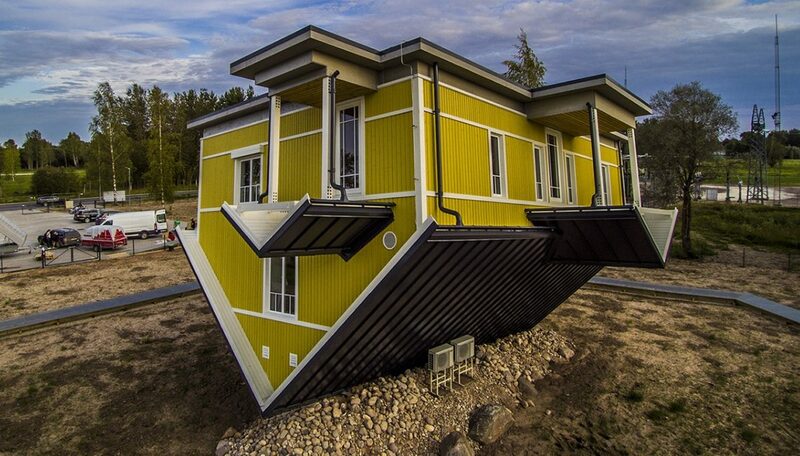 An upside-down house was built in Tartu, Estonia year 2017. Today we are thrilled to receive the news that the construction of the house is finally approved by the Municipality. But how difficult is to build a house that cheats gravity? It is unusual to see a building like this. Upside down houses have been around for a while, mainly built as an attraction for tourists. This upside down house will be the main attraction of a new entertainment park to be built in south Estonia. Note that some of these houses are not accessible and they are nothing more than elaborated sculptures. With this in mind, the “Upside Down House of Tartu” will probably become soon part of this popular list of must-see buildings. We receive quite many questions concerning every aspect of this one-of-a-kind building. Here we share some of the most interesting facts about the upside down house. Technically yes. The house was designed to meet regular building standards. It is no different from a real 149 m2 house, on two floors. Inside you will find electricity, heating, ventilation systems. The only thing missing is water… but it could be easily added. However, technical installations are not the only thing one should be concerned about. Inside the house, all the furniture is upside down: tables, chairs, garderobes, etc.. are hanging from the floor over your head. Even the toilet stands upside down in mid air! That would be a pretty challenging way of living. Yes. The building is inclined by 7°, on both axis. As result of this architectural choice, no surface in the house is perfectly horizontal or vertical. This particular geometry was chosen to create the illusion of “wrong gravity“. As a visitor in the house, your very ability of standing will be put to the test due to the combined effect of “wrong gravity” and “upside down” perception. Inclination has been the main complexity factor on this project. In fact, while designing an inverted house is quite easy, it turned out that making it stand with leaning walls requires a lot of extra effort. The inclination affected design work and it will affect construction works, especially concerning safety and time necessary for installing and securing the elements in their leaning position. To overcome the effect of gravity, engineers had to use a massive steel frame in the roof construction wich is in contact with the ground. There are 299 steel bars composing the frame of the house, amounting to a total weight of over 12 tons. During construction, steel workers will have to perform over 600 connections using thousands of nuts and bolts. Part of the roof will be embedded in the ground while the other side will be standing up in mid-air. The height of the building on its highest point will be over 9m. The entrance of the house will be through the balcony door of the second floor, which has been conveniently located near to ground level and it is accessible via a normal stair. Dealing with the calculations for the steel structure has been the biggest challenge our designers came to face. In usual constructions, most of the structural components are subject to vertical forces. In this building, due to the double inclination, all structural components are subject to 3D forces. This makes dimensioning of the structure unusually complex. Once solved the structural challenge, designers had to deal with the solutions to protect the building from the weather. In fact, the foundation you see up in the air is the roof of the house. The roof is then flat and inclined and all the water gathering up there must be able to reach the ground without infiltrating the structure. This was solved rather easily with an inverted rainwater system collecting the water up in the foundations (roof) and bringing it to the roof (foundation). The major challenge concerning water resistance has been to find a good solution for preventing the water entering from windows. This is usually achieved by using metal sills on the bottom of the windows… but here windows are upside down, so the sills are actually on the top and the water drips down into the sill itself making it very complicated to protect the walls. Engineers solved the problem by using small gutters embedded into the sills and implementing a double sills system. The building now is 100% gravity-safe and weather-safe. This project has been an interesting challenge for our designers. Our Project Manager was also actively involved in during the design phase to make sure that all aspects related to construction would be taken into account. Building this object will be a step forward for our company and also will be a testimonial that great results can be achieved when creative minds are put to good use with a common goal. More pictures about the construction process and finished project can be found on reference page.